Oil on c-print on aluminium, 88,5 x 111 cm, 2011. 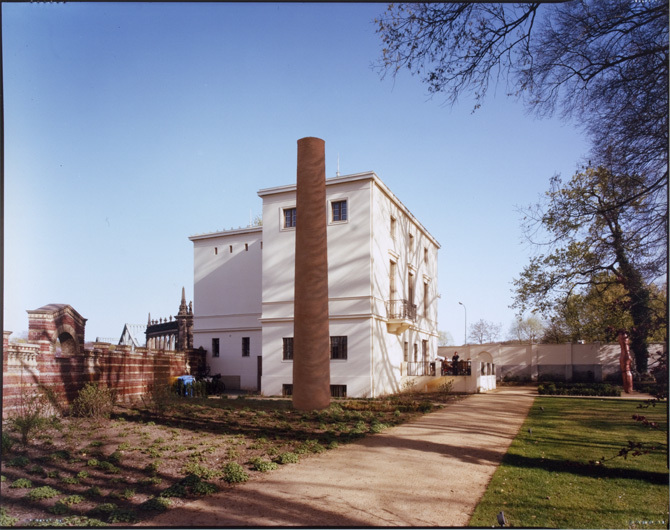 This project image depicts the to-be-constructed "First Chimney II" (= the First Chimney re-constructed). Made for the exhibition "Spiele im Park" (12.6.2011  2.10.2011), curated by Max Hollein and Martin Engler. Artist list: Janet Cardiff & Georges Bures Miller; Bethan Huws; Olaf Nicolai; Tobias Rehberger; Tino Sehgal; Roman Signer; Jan Svenungsson, Lois Weinberger.